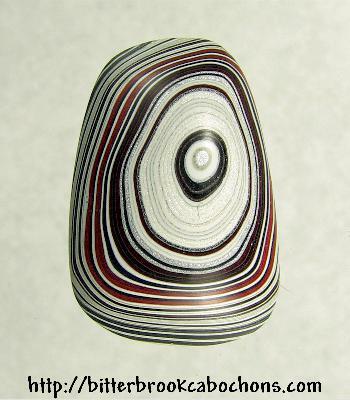 This cabochon is from a piece of "pipe" Fordite, wrapped around a pipe. You are looking at it from the "outside" of the material, or into the pipe. It presents a different set of patterns as this one which shows the "inside" of the material. 22.5mm x 15.5mm x 6.5mm. Weight: 10.20 carats. Do you like Fordite Cabochons? Click here to see all of the Fordite Cabochons on the site!